Depending on who you speak to, it is either the most over-rated vintage bicycle in existence, or the Holy Grail: The classic Bianchi in the legendary "celeste" green. 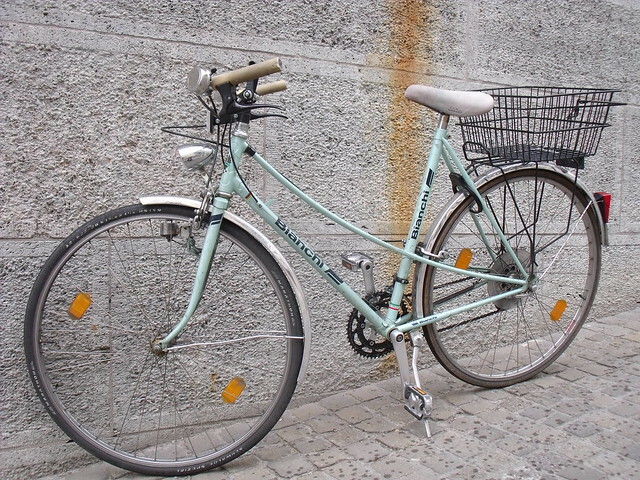 The first time I saw a true vintage Bianchi was a couple of years ago, in Austria. It was many decades old and partially dilapidated, hanging in a dark corner of a stuffy bike shop - among dozens of other classic Italian bikes. Still, the Bianchi was the one I noticed. From across the room, I walked toward it with a flutter in my chest, my hand already stretching out to touch the lugwork. Amore. Started in Milan in 1885, Bianchi is described as the world's oldest bicycle company still in existence. Though it has always produced a wide variety of models, Bianchi is best known for its classic racing bikes - particularly in the distinct "celeste" shade that has become its signature colour. Of dubious origins (some say inspired by the Milan sky, but most likely a product of surplus WWII paint), the exact formula of "celeste" has varied throughout the years. But it has always been some magical mix of sage green and powder blue - offset by the seductive shimmer of Campagnolo components. As I stare at these images and sigh, I wonder what on earth attracts me to these bikes - Straight out racing bikes that two years ago I would not have even known how to mount, let alone ride. Bianchi even produced several mixte models throughout the years - But somehow, it's the classic racing bikes that really draw me in. And while initially my interest in Bianchi was purely aesthetic, that began to change as my cycling skills expanded. Over time, I have transitioned from thinking of these bicycles as mere eye candy, to seeing myself riding one in future - most likely as my "wildcard" bike, to replace the vintage Trek currently occupying that spot. One interesting industry development, is that the current Bianchi company is re-introducing lugged steel to its modern line-up as part of the Classica line. This began with the partly lugged Dolomiti roadbike in 2009 - greeted with some dismay due to its awkward mix of modern and classic features. The 2011 line up looks more promising, with the Tipo Corsa and the Pista Classica - both featuring chrome lugwork and fork crowns. Though the lugs look somewhat generic to me and the price is likely to be prohibitive, I am excited to see this and look forward to the models being released. 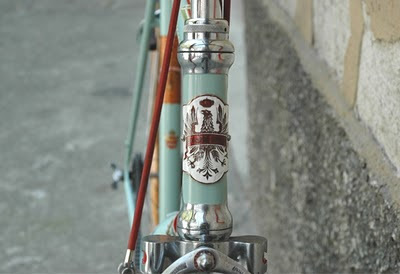 Bianchi "celeste" is at its best when surrounded by lugwork, on a classic steel bike. That first bicycle is perfection. You've already got it, right? I wish it was a pre-war or early post-war city bike, that would be most interesting to me, but you are young, with the wind in your hair. Bella Velouria! Viva Bianchi! 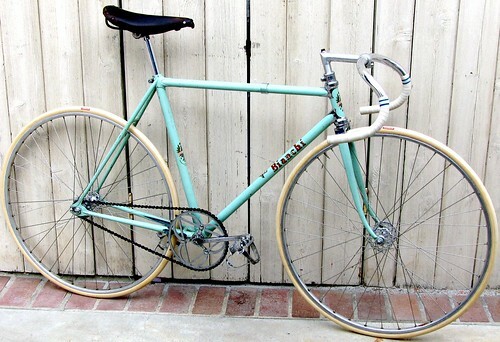 I have long coveted an Italian-built Bianchi celesste model. 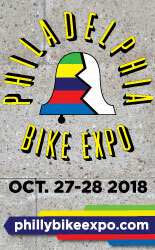 I remember at the time I purchased my first "serious" bike, I looked at a couple Bianchis and the salesman told me that Bianchi had handed out buttons with nothing but the celeste color on them. I don't know the history of Bianchi's lugs in specific, but I do know that Italian lugs are traditionally much plainer than, say, British ones. Their quality lies in how finely they're filed. I've only ridden two or three of the Italian-made frames. One was an early-60s model that was magical, and quite expensive even in the early 1980s. The feeling was like the first time one latches the 5-point harness in a classic rally car. Your heartbeat quickens, though you haven't actually moved yet. 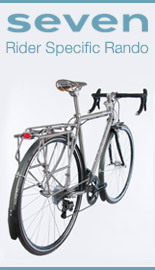 Eye candy--have you test ridden one? I for one can take a pass on the color, because I am color-blind. To me, it looks like a pale powder blue with a beige-like tinge. Not interesting or attractive at all. I'm sure the old Bianchis are perfectly nice bikes, but if I had one, I'd have it repainted. The shade of celeste has actually varied quite a bit over the years. Sometimes it looks like a Crest toothpaste green; other times it's more like turquoise; still other times it's been an almost sage green or sky blue. I like the hue of the bike in the first two photos. As for ride: I actually rode a real Pista (not the hipster model) that was made in Italy of Columbus tubing joined by lugs. It was actually very responsive the few times I took it to the velodrome, and was fairly comfotrable (as track bikes went, anyway) on the streets. I also had one of their road bikes from the late 70's or so. I thought it was the bee's knees until I rode and bought a Colnago. And I did a tour in France, Belgium, the Netherlands and Germany on a Bianchi Eros. It was meant to be an all-arounder, and it wasn't bad, though it was a bit twitchy with the load (not large, considering the trip I took) I carried on it. My verdict: Bianchis are good at what they're made for, but I don't get the mystique about them. And, as I said, I like the color, depending on which shade it is. But even so, there are others I prefer. As you go searching for your Bianchi, be aware that through the '60s at least most models had integrated headsets (your first picture), including city bikes like this 1948 Varazze. The head tube lugs are part of the headset and provide cups for the races, which are separate pieces. Replacement parts are hard to find so make sure the bearing races aren't worn beyond what can be repaired with polishing. Bianchi's reputation rests on merits that are not their own, so as a "Holy Grail," yes, they are highly overrated. 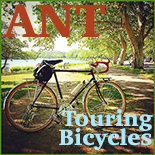 Conversely, Atala is outright denigrated in some circles for being - the exact same thing as the Bianchi is. Go figure. Both are perfectly good bikes and people are free to like what they like, but of the era I think that Colnago and DeRosa are most deserving of their reputations and to a lesser extent Cinelli. sausend - I don't mean plainer, but literally more generic - not as "Bianchi-like" as they should be. For instance, Bianchi has always had distinct fork crowns and some phantographing on the chainstay tips as well as the crowns. These new models look like the lugs are sourced cheaply and mass-produced. Moopheus - Interesting; my grandfather is red/green colour blind as well. I guess no bomb defusing for you! If I saw the bike as light blue with a beige tint, I would not find it as compelling. Phil - That Varazze link, yum! I think I am safe from the older models as they'd be absolutely unaffordable. I have a feeling mine will be early '80s. The bike in the first picture is 1935! kfg - When you say that "Bianchi's reputation rests on merits that are not their own", do you mean the merits of the racers who just happened to win while riding Bianchis, or do you mean the merits of Italian bikes as a concept? I am surprised you don't see Colnago as over-rated; in Europe that was the Italian bike I saw the most. I guess one thing Bianchi has going for it, is the history - Unlike the others, it is a very old brand. Justine - Interesting that you owned one and moved on. It might very well be that I'll do the same - though I have no plans to cycle long distance on it; it would most likely be 40 miles tops. 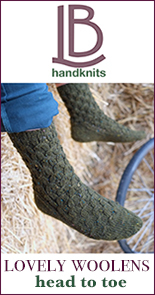 The sage green is my favourite, especially when paired with red lettering. But alas, those are almost impossible to find! I think the modern celeste is a bit over-saturated and neonish, which I guess is a good match for the carbon roadbikes. "do you mean the merits of the racers who just happened to win while riding Bianchis"
Not "just happened," but hired by the marketing department to do so. Bianchi was never a small craftsman shop, but a major industrial manufacturer interested in selling quantities of bikes. It's not about the bike, it's about the brand. This is what I meant when referring to Atala as the same thing. And some of those Bianchis that won races were Bianchis in decal only and not the same bike offered to the buying public. Italian aficionados often know who actually built the bikes and buy from them. "in Europe that was the Italian bike I saw the most." Maybe they know what's best? Are there not a lot of the old Raleighs you love around as well? "it is a very old brand." A brand is a bit of abstract intellectual property. It is not a "thing." It only exists in your mind. I don't for a minute think that my Pacific has much of anything to do with Schwinn, beyond the basic design. The bike is the thing. "or do you mean the merits of Italian bikes as a concept?" As a "mystique" Italian bikes are overrated, but I am on record here as one who loves both Italian bikes and Italian cars, despite also being on record that Japanese is the Best Evah! I raced Italian. My Quickbeam is Japanese. "those are almost impossible to find!" Color is only skin deep and I have reason to suspect you know where to find Sugarcoat. "And some of those Bianchis that won races were Bianchis in decal only and not the same bike offered to the buying public. Italian aficionados often know who actually built the bikes and buy from them." And not just Italian marques. Eddy Merckx's Peugeots were hand built by Ugo de Rosa (a de Rosa by any other name...?) and rebadged. Later, when Eddy rode for Molteni, Ernesto Colnago built his personal bikes. The famous 1972 hour record bike with Windsor transfers (a Mexican mass producer of Cinelli clones) was hand crafted by Ernesto. The practice continues today in the pro peleton. Sponsored by Bontrager but your top rider prefers Zipp? No problem. We'll just put Bontrager transfers on the Zipp rims. Fausto may have won the Giro on a bike badged Bianchi. But it wasn't the same bike you or I would look at in a bike shop in Rome. That is interesting. I'd like to find out some time, just for historical curiosity's sake. I am aware of the branding and approach you're describing, and that in itself is interesting to me. I think that I mainly just want to "understand" the bike, compare it to other Italian bikes I have ridden, and get it out of my system. When I am in Austria, I see so many Italian bikes - but it's mostly Colnago, De Rosa and Moser, their lugwork ruined with cheesy 80s paintjobs. I think I've come to inadvertently associate Colnago with those paintjobs, which is why I never developed a crush on one. But when you and Justine mention them, I pay attention. "lugwork ruined with cheesy 80s paintjobs." de' Medici gathered ungodly amounts of money and power, but did not always display it in the best of taste. Nonetheless the underlying craftsmanship was often as good as it gets. Buy what you cannot create, create what you can. Am I the only one transfixed by that lovely curved top tube on the mixte? While the bike looks fairly modern judging by the decals the retro fittings complement it beautifully. That is one glorious mixte. Maybe a little careful detailing on the lugs - say a hairline gold line around them - would make their beauty stand out; as it is they are a little lost for my tastes. Ah, beautiful. I know someone with an old one which he rides all over in all weather. He's in his late 60's so who knows how long his celeste bianchi has been with him. My husband has a 60's or 70's italian bike and it is beyond stunning. The entire frame is chrome with paint over top so it glows like a renaissance painting. He got it on craigslist and had dubious parts, but it rides like the wind. In fact he can barely contain himself on the bike-it just goes fast. Whatever it is that the italians were doing, they produced incredible bicycles. So, I would say find an older celeste bianchi. The new ones will not be the same. It's as if these esteemed companies lost the ability to make fine steel bicycles when they flocked to aluminum chunky bso's. The celeste is stunning and though I am not sure I like the colour personally, I would not hesitate on a celeste bianchi-maybe the mixte! Marco et al - Okay, okay, you have convinced me. I will graciously accept Colnago donations, in 52cm frame size please! Carinthia - I would not say no to that mixte at all! I would say the bike is late '70s - early '80s, though it looks like the owner replaced a couple of components with modern ones. At first i wanted to buy a bella ciao or abici but some of your posts inspired me on getting a more special bike and work for it. So thanks for your posts and inspiration, i'll keep you informed! Carinthia, you're not the only one. That's the one that caught my eye too. Absolutely gorgeous! I am so glad to hear that you are designing lugs - that is the bike frame I'm waiting to see - the 2021 Velouria LB in lugged steel and everything tweaked just as it should be. ". . .when I build my own frame..."
I predicted this undertaking back when the Royal H was still a few bits of metal and a gleam in your eye. Consider making your first frame with store boughten lugs and straight gauge tubing from an industrial supplier and saving the "special" for number two. 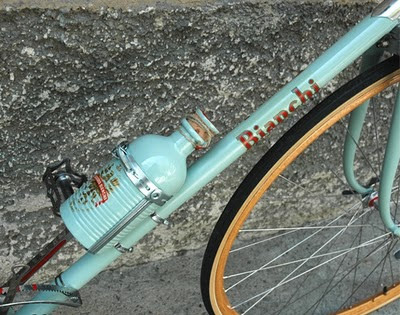 What is the model of that Bianchi Mixte? I think it's almost my dream frame. Kate - sadly, I do not see a model name on the bike and I think a mixte like this would be *very* hard to find. If you click on the picture, the person who took it writes that they spotted it in Zurich. Anibal - Wow. Is that 1950s? I hope you are able to ride it! kfg - Oh I would definitely make the first frame with standard lugs. Especially since I suspect that I will be quite bad at it! Well, if you're in no particular hurry to git 'er done, get at it then. "I suspect that I will be quite bad at it!" Nonsense. You're an artist. You already know how to work with your hands. It's just a matter of training them in the specifics of this work, which can even be done in artistic forms. "I don't even make my own wooden canvas supports!" I sing the praises of Masonite. ". . .mechanical talent, which I simply may not have." There's an old engineer's saying: Experience is proportional to the amount of equipment destroyed. No one has mechanical talent, they have experience. The sooner you get to work gaining experience, the sooner you'll stop destroying quite so much equipment. Oh I disagree. My father can't draw people beyond stick-figure level, and both my mother and I have tried to teach him. Yet, he can draw blueprints of structures free-hand more precisely than I can do with a t-square and compass. The Co-Habitant can examine a piece of complex equipment - say, a camera - and produce a correct technical drawing of it once he understands it, without even looking at the object. Though both have had practice in these things, to a huge extent it's natural for them - and fun, while drawing people and capturing facial expressions is not natural for them and they have trouble understanding some of the principles behind it. For me, it's the opposite. Velouria - Of the people named, which are the ones that can't tie their own shoes? SM - Ooooooh, I hadn't even thought of that. Yes; yes it would. Can't wait to see it. Of the people named, I am the worst at tying my shoes, especially as increasing nerve damage reduces my fine motor skills over the years. I am worried the Pixies might sue me if I use "Velouria" in any commercial capacity. That actually came up when I was considering a pen name for a potential publication. I may in all seriousness have to contact their representative and discuss it. "I am the worst at tying my shoes ..."
So, you come from family with mechanical aptitude, but have a hurdle to work around yourself. It'll work out ok.
Lots of racers won on BINOs, PINOs, and other INOs. ("In Name Only.") Do you think, for a moment, that Lance or any other members of the US Postal team rode the same Trek Madones you see in your local shop? That makes me think of the Shimano road clipless pedals that have never really caught on. Shimano developed pedals that were inspired by LOOK pedals because the team's Treks were all equipped with the latest-model Dura Ace components. But Lance preferred his old pedals, which upset Shimano's marketing people. So they came as close as they could to Lance's old pedals, while making something that was specifically Shimano. I've emailed Bianchi for some information - there's really nothing on the web. This is the first mention I've been able to find of it. "Lots of racers won on BINOs, PINOs, and other INOs. ("In Name Only.") Do you think, for a moment, that Lance or any other members of the US Postal team rode the same Trek Madones you see in your local shop?" Lisa - That's awesome! Unfortunately, I doubt that today's Bianchi conglomerate has any info about these 1970s - early 80s models. My first really nice road bike was a Bianchi bought in the mid-1980s. Like you, I was drawn to the Celeste green. It seems to be a color that people love or hate. I sold the Bianchi a few years ago and have regretted it every since.